This data release provides an improved and robust integrated database (usSEABED) of seabed characteristics for the Pacific continental margin of the United States that fulfills a need for information about seabed characteristics for use by geologists, ecologists, biologists, resource managers, and national defense investigators. usSEABED provides a digital, integrated database of existing physical data and information from the sea floor, including textural, statistical, geochemical, geophysical, and compositional information. It uses the dbSEABED data mining and processing software to extend the coverage of information in areas where data coverage is more descriptive than quantitative. The data coverage includes the U.S. Pacific Coast from Cape Flattery (including Puget Sound) to the Mexican border, including major estuaries, for example, San Francisco and Willapa Bays, and beaches, and extends seaward across the Continental Shelf and Slope. More than 100 different data sources containing over 65,000 data points from more than 25,000 sites are currently contained in usSEABED for the contiguous United States along the Pacific margin. This data-series publication is the third in a set of similar publications that covers the entire Exclusive Economic Zone of the United States (U.S. EEZ). Also available are the sister publications of usSEABED data from the Atlantic margin (Reid and others, 2005) and the Gulf of Mexico and Caribbean regions (Buczkowski and others, 2006). Another companion publication will include data from Alaska and Hawaii. Each of these publications will be updated as significant amounts of new data are included in usSEABED. Current information about publications and other issues are posted on the usSEABED web site. This publication contains information on the usSEABED data collection, the dbSEABED program processing, as well as a Data Catalog where the data are included (within compressed files) as GIS layers and comma-delimited text files. The overall usSEABED database holds data for the entire U.S. EEZ and is an ongoing task of the National Sea Floor Mapping and Benthic Habitats (Pacific) and Marine Aggregates Resources and Processes projects, being conducted by the USGS Coastal and Marine Geology teams in Santa Cruz, CA, Woods Hole, MA, and St. Petersburg, FL, and the University of Colorado. It is expected that usSEABED will continue to expand by the incorporation of new data sets and by the utilization of the data in new and different ways. As significant changes are made, we expect to reissue updates of usSEABED. Data contributions and (or) additional partners are welcomed. For information, please see the contacts page. Published usSEABED data from this region and others are accessible online (using ESRI™ ArcIMS®) at http://coastalmap.marine.usgs.gov/regional/contusa/. Data layers will also be submitted for viewing and downloading through Geodata.gov. The quality and protection of natural environments is a high priority for the Nation. This includes Federal lands in the coastal and marine realm, where a variety of human activities stress natural systems and resources. The USGS is a lead scientific agency conducting research on the Atlantic, Gulf of Mexico, and Pacific margins to better understand marine sea-floor environments. This research on benthic habitats is conducted under the general topic of habitat geoscience, which is defined as the study and classification of seabed habitats in the context of their geologic framework, their response to seabed processes, and their function as substrate for invertebrates and fish, is underway in all three regions. This research requires close collaboration between geologists, biologists, and oceanographers. High-resolution and detailed knowledge of bottom characteristics and sediment distribution, a goal of the usSEABED database, is fundamental to these studies. The National Sea-Floor Mapping and Benthic Habitat Studies Project for the Pacific coast, works collaboratively with other Federal, State, and local agencies to investigate geologic controls on benthic habitats in bays, estuaries, fjords, and continental shelf environments. The project employs a multipronged approach, utilizing tools that include sidescan, backscatter imagery, and multibeam sonar, bottom video and photos, Laser In-Situ Scattering and Transmissometry (LISST), LIght Detection And Ranging (LIDAR), physical sampling and underwater digital microscope imaging (for example, and eyeball camera), and usSEABED. The collocated information is integrated, leading to better maps and increased understanding of habitats on a variety of scales. An important analytical sidelight to this research is a useful understanding of the relations between the various mapping and analytical techniques that allows for better mapping and assessment abilities. A critical issue studied by the USGS Sea-Floor Mapping and Benthic Habitats project for the Pacific is the impact of human activities on benthic habitats. These activities range from land development issues, watershed usage and pollutant transport, sanitary outfalls and waste disposal, shipping and anchoring, and dredging and spoil dumping to glacial retreat, uplift, the relative importance of artificial reefs as habitat, and invasive species. Endangered and threatened living resources, such as Pacific coast rockfish (Sebastes) and white abalone, are of prime concern to the public and managing agencies. One approach to the restoration of these habitats is the establishment of Marine Protected Areas (MPAs). The USGS and its partners use their expertise to map and characterize benthic habitats at biologically relevant scales to assist in MPA design and other fisheries management efforts. These efforts are centered in areas managed by National Atmospheric and Oceanic Administration (NOAA) National Marine Fisheries Service, NOAA National Marine Sanctuaries Program, and the National Park Service. For more information about sea floor mapping and benthic habitat research by the USGS in the Pacific, see http://walrus.wr.usgs.gov/nearshorehab/. Continental margins are products of complex geologic processes. They comprise submerged landforms that offer a variety of benthic habitats for fisheries, as well as affect navigation, homeland security, and engineering activities. Continental shelves also contain hard-mineral deposits, such as sand and gravel, that are potential aggregate resources. Coastal erosion, resulting from a combination of natural (storms, sea-level rise, sediment starvation, land subsidence) and anthropogenic processes (dams, dredging, coastal engineering structures), is pervasive in most U.S. coastal regions. Development in the coastal zone continues to increase, and demographic projections show that the trend of people moving to the coast will likely continue, placing more people and development at increasing risk from coastal hazards. With future global climate change likely to cause changes in storm frequency and resulting accelerated global sea-level rise, coastal regions are likely to experience even greater erosion, inundation, and storm-surge flooding. Figure 2. Marine sand bodies, having diverse origins and evolutionary histories, can be buried or exposed on continental shelves and often have been greatly modified by marine processes associated with the Holocene transgression. 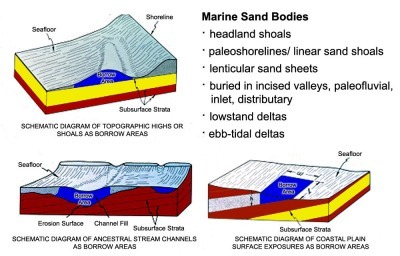 Nearshore marine sand bodies of the types shown above may offer the best potential sources for high quality sand for beach nourishment (Williams and others, 2003). The USGS, in collaboration with other Federal agencies (U.S. Navy Office of Naval Research (ONR), Minerals Management Service (MMS), U.S. Army Corps of Engineers (USACE), National Oceanic and Atmospheric Administration (NOAA) and others), coastal States, and universities, is leading a nationwide effort to gather legacy marine geologic data for use in conducting assessments of offshore sand and gravel resources and for producing GIS map products of sea-floor geology that can serve many additional needs. Assessments are being conducted in offshore Louisiana, the New York Bight (New York-New Jersey), and the Gulf of Maine regions. The GIS maps and usSEABED database from this study are providing fresh scientific insights into the geologic character and development of U.S. continental margins and useful information about the quality and potential availability of offshore sand and gravel aggregates. Additional details are available at http://woodshole.er.usgs.gov/project-pages/aggregates/index.htm. Applications of research results include fishery management, habitat disturbance and recovery studies, impacts of invasive species, studies of deep-water coral habitats, the fates of contaminants from coastal sources, location and monitoring of disposal sites, the routes of cables and pipelines on the seabed, and the location of aggregate deposits having potential for use for beach nourishment. For more information on these and other research about coastal and marine issues, see http://walrus.wr.usgs.gov, http://marine.usgs.gov/, and http://woodshole.er.usgs.gov/.